Many pellet grills compete for the title of the best wood pellet grill, but how do you decide which grills make the cut? The following article addresses 10 of the highest rated wood pellet grills out today. For organizational purposes, they’re categorized from most expensive to most affordable. We examined them based on several criteria such as user-friendliness, how fast and well it heats, and additional useful features such as multiple racks in order to find the best wood pellet grill for 2018. Next on our best wood pellet grill list is this 6-in-1 pellet grill that aims for versatility in your cooking from roasting to grilling and smoking. There’s an Integrated Digital Elite Controller for maintaining temperatures up to 450ºF (232.2ºC). It may develop hot/cold spots though. Once cooking, the 3-piece grate is simple to clean. It’s made with enclosed storage space and locking casting wheels. In addition, it also comes with two side shelves. Smoke Daddy Inc. brings out their new Pellet Pro that features a new top rack for added cooking space. You can grill temperatures from 160ºF (71.1ºC) to 450ºF (232.2ºC). There’s a new PID Controller as well to help control it all, and the included meat probe helps you keep an eye on internal temperatures. Although it does smoke well, sometimes it can work too well. The design is overall sturdy, but it will take more than one person to put it together due to its weight. This grill has other benefits such as a durable bottom rack for storage and a large hopper capacity. The next choice on our best wood pellet grill list is the Series 800 Elite from Louisiana Grills that features their standard Digital Control Center as well as a programmable meat probe. With its double-wall construction, heating food up is quick and simple (180ºF/82ºC to 600ºF/315.6ºC). However, take caution that overcooking can occur. As for the hopper, it’s rather small, so pellets need replacing often. Features include a large, stay-cool vented handle, four caster wheels, bottom storage space, and a side shelf with hooks. With Smart Smoke technology, the grill uses an automated auger feeder and digital control system to produce your optimal amount of smoke. It has a cooking range for the grill of 160ºF (71.1ºC) to 500ºF (260ºC). The sear box, which runs on propane, can reach up to 900ºF (482.2ºC). Moreover, with the sear box, you get more versatility in cooking. You can smoke in one section and grill in the other, making the grill good for multi-tasking. Assembling it is straightforward, but it can have some quality control issues. The 6-in-1 Texas Elite Pellet Grill is designed with durability in mind with its steel body, powder coat finish, and quality legs with caster locking wheels. Its Digital Elite Controller is useful in maintaining control, and it’s easy to ignite using the simple on/off switch. You can change out the pellets if you want to go for a different type, however, is difficult as it lacks a trap. It offers plenty of cooking space to grill, bake, sear, etc. whatever you want. However, this does have a slight learning curve. Another popular grill many consider to be the best wood pellet grill is the Z Grills Grill & Smoker. It features two racks for greater cooking space, and it has an 8-in-1 design for an assortment of cooking methods. With a 20lb (9.1kg) hopper capacity, you can grill longer without changing the pellets. It has a digital control board, internal temperature sensor, pellet purge system, and a shutdown recycle mode. The automatic electric feed system can hold temperatures from 180ºF (82.2ºC) to 450ºF (232.2ºC). When first started, however, the temperature may bounce around a bit. If it is hard to decide, you can also check here more smoker grills. The SmokePro DLX Deluxe has an advanced control system and cleaning system. It has a digital temp control with dual LED readout and an automatic auger feeder. For clean-up, it features an exclusive Ash Cleanout system. There’s also a hopper cleanout and grease management system. Pellets can be difficult to remove though. It also features a temperature probe/sensor and a shutdown mode. There’s a side shelf implemented as well and a warming rack inside that may get in the way sometimes, but it can be removed. The 700FB has a range of 180ºF (82.2ºC) to 500ºF (260ºC), and the Digital Control Board grants full control of the temperature. It lights easily with the electric igniter system. The exhaust design provides air circulation. For smoking purposes, it’s tough to hold a constant temperature. However, at higher heats, some of the paint may peel. There’s enough room with cooking surface (2 racks) and hopper to limit the number of pellets used. The pellet clean-out is easy to use, and the grill also features a dome thermometer, bottom shelf, and grease bucket. This Davy Crockett Grill is the best wood pellet grill to transport. As it can run on 12V or 120AC, it can be used just about anywhere. The legs fold as well for easier transport. It features a digital Wi-Fi controller that can be monitored through their iOS or Android app. This allows for manual or ranged control. It does have a learning curve to understand both the grill and Wi-Fi app, however. Other features include a thermal sensor, grease bucket, and side tray with hooks. 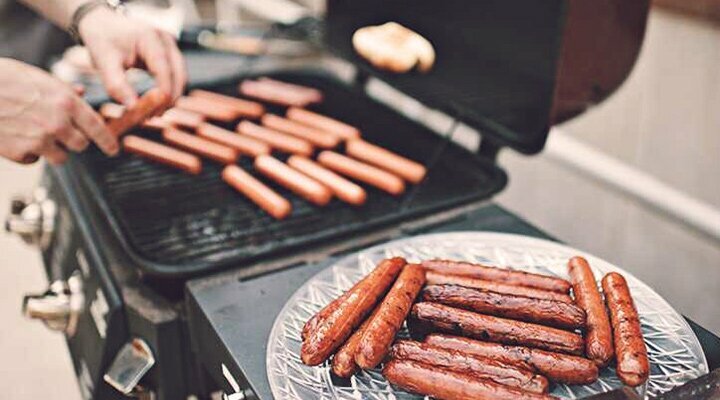 If you’re curious about what constitutes as the best wood pellet grill, the above list offers a variety of grills with both the advantages and disadvantages highlighted to give you a better idea. For those of you who have used the grills mentioned, what did you think? Or do you have other products in mind we didn’t mention? Share your thoughts in the comments.